Rips are not unusual for goldfish to develop, particularly long-finned goldfish. A fin rip may requires some attention from the fish keeper: You'll want to identify the cause so you can act to avoid recurrence. 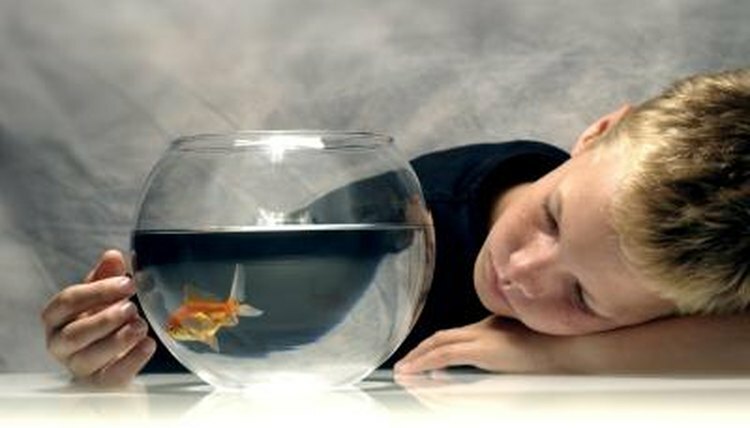 Additionally, your intervention might be necessary if the injury leads to complications like fin rot. Identifying the original cause of the torn fin is important; otherwise it could recur. Injuries to the fish can happen during transport if a fish gets a fin tangled in a net. Some unlucky fish can injure their fins in collisions with objects in the tank. Fish-on-fish violence can injure a goldfish's fins. Long-finned goldfish are particularly vulnerable to injuries from aggression. Goldfish kept outside in ponds may suffer fin damage from predators such as cats and wildlife. As hard as it can be, the best thing to do with a ripped fin is to wait and see. According to zoologist and marine biologist Dr. Neale Monks, "fin membranes heal quickly, and there’s no need to use an anti-finrot or anti-fungus medication unless symptoms of either of these diseases becomes apparent." A goldfish's fins tend to heal themselves quickly in clean water. If the fish is the victim of another fish, separating it can give the fish a chance to heal itself. However, if you see signs of fin rot or other secondary infection. Fin rot is the most serious complication that can come from ripped fins. Fin rot most often happens in fish tanks and ponds without adequate maintenance. The most obvious sign of fin rot is visual. The fin of a fish with fin rot will have a ragged edge, unlike injuries, which tend to have a more clean edge. Additionally, it may have red streaks. Fin rot can quickly eat away at a fin down to the body of the fish. It leaves goldfish vulnerable to secondary infections, bacteria or fungi that infect a fish only when something else is wrong. If a ripped fin leads to fin rot, treatment is necessary. In the United States, pet shops sell aquarium antibiotics over-the-counter. These include erythromycin, minocycline and sulfadimidine. Follow the manufacturer's instructions carefully. Meanwhile, tonic salt can treat fin rot in goldfish. A dosage of 1 tablespoon per gallon of aquarium water can discourage fin rot without hurting your fish. A well-maintained aquarium goes a long way in preventing and mitigating fin rot even in fish with ripped fins.